Evolution is not explicitly mentioned in the Tipitaka. As no major principles of Buddhism contradict it, many Buddhists tacitly accept the theory of evolution. Questions about the eternity or infinity of the universe at large are counted among the 14 unanswerable questions which the Buddha maintained were counterproductive areas of speculation. As such, many Buddhists do not think about these kinds of questions as meaningful for the Buddhist goal of relieving oneself and others from suffering. One does not need to know the origin of life, nor agree with the Buddha's position on scientific topics, in order to achieve enlightenment. Lopez elaborates that the process of Rebirth (into any of a large number of states of being including the human, any kind of animal and several types of supernatural being) is conditioned by karma (action of consciousness), which explains Dalai Lama's view. 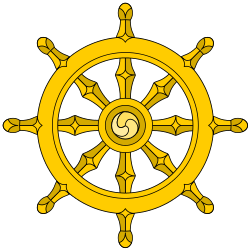 Anagarika Dharmapala once stated that "the theory of evolution was one of the ancient teachings of the Buddha." This Parable of the arrow has often been used to illustrate the Buddha's teachings that "practitioners who concern themselves with the origins of the universe and other topics are missing the point of religious practice." Albert Low, a Zen master and author of The Origin of Human Nature: A Zen Buddhist Looks at Evolution, (2008) opposes neo-Darwinism and the selfish gene theory as he claims they are materialistic. He also opposes creationism for being dogmatic and instead advocates spiritual evolution. ‘There comes a time, Vasetha, when, sooner or later after a long period this world contracts. At a time of contraction, beings are mostly born in the Abhasara Brahma world. And there they dwell, mind-made, feeding on delight, self luminous, moving through the air, glorious—and they stay like that for a very long time. But sooner or later, after a very long period, this world begins to expand again. At a time of expansion, the beings from the Abhasara Brahma world, having passed away from there, are mostly reborn in this world. Here they dwell, mind-made, feeding on delight, self-luminous, moving through the air, glorious— and they stay like that for a very long time. Because the Buddha seems to present a model of cosmology wherein the universe expands and contracts over extremely long periods of time, this description has been found by some to be consistent with the expanding universe model and Big Bang. Some feel that the Aggañña Sutta was never meant to be taken literally. According to the Agganna sutta, animals must have been present before humans completed their "devolution"; moreoever, the asexual proto-humans had apparently domesticated the cow and lived in towns and villages. ↑ "Religious Differences on the Question of Evolution". Pew Research Center's Religion & Public Life Project. 4 February 2009. 1 2 Asma, Stephen. "Evolution doesn't bother Buddhists". Chicago Tribune. Retrieved December 23, 2013. 1 2 3 "Buddhist Studies (Secondary) The Buddha's Wisdom and Compassion". 1 2 3 "Four reasons Buddhists can love evolution". Wildmind. Retrieved December 23, 2013. ↑ Low, Albert (2008). The Origin of Human Nature: A Zen Buddhist Looks at Evolution. Sussex Academic Pr. ISBN 1-84519-260-5. ↑ Williams, Paul (2004). Buddhism. Routledge. p. 102. ISBN 0-415-33228-1. ↑ "The Agganna Sutta". About.com. December 23, 2013. ↑ Tweed, Thomas A. (2000). American encounter with Buddhism, 1844-1912: Victorian culture & the limits of dissent. UNC Press Books. pp. 107–108. ISBN 978-0807849064.